I'm a huge fan of Final Fantasy. Well, I was a huge fan of Final Fantasy. Though I loved the series during the Final Fantasy VII, VIII and IX (Playstation) era, when I played Final Fantasy X back in 2001 I just wasn't feeling it. Sure, it had fantastic graphics for the time and the gameplay was fun, but the plot and chracters just didn't cut it for me. Though I loved Final Fantasy XII, I haven't really enjoyed the series since then. But as of late I'm finding myself once again hyped by Final Fantasy games, namely the upcoming Final Fantasy XV. However, before that's released yet another Final Fantasy game has just landed, and this is a HD remaster of an old Playstation Portable title. So, how does it fare? 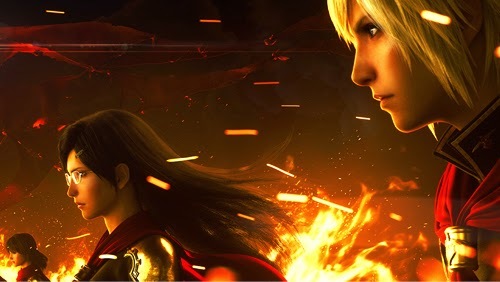 Developed by Square Enix and out now on Playstation 4 and Xbox One comes Final Fantasy Type-0 HD; a spin-off of the main series that is easily better than Square Enix's 3 previous Final Fantasy games. Type-0 HD was originally released back in 2011 for the Playstation Portable, but despite great reviews within the Japanese press, a Western release never materialized. That said, since its original release and before this HD remaster, fans of the series did create an English language patch for the PSP version, but that's now a bit useless to be honest. This remaster reworks the graphics in HD and slightly tweaks the gameplay. I played a chunk of Type-0 on the PSP back in 2013, and though I did enjoy my time with it, I kept thinking that it would work better on a console. It does, as this latest release feels like it unburdens the game to show off its true potential. The plot and characters in Type-0 HD are kind of like if the Harry Potter and Final Fantasy series had a baby. The fact that you're a student in a magic school will interest Harry Potter fans, while the messy and convoluted plot will make Final Fantasy fans fit right in. The plot focuses on an ever raging war between four nations. Each nation has its own unique crystal which grands them a powerful ability. You take on the role of Class Zero; a group of 14 students from Vermillion Peristylium, the nation that holds a crystal that lets them control magic. As Class Zero you're tasked with fighting the other three opposing nations, and are given missions that range from attacking towns, defending bases to simply wiping out an opposing force. Simply put Type-0 HD's focus is war. It's a new and interesting concept for the series, but it quickly loses itself with terms such as “l'Cie” and “Agito”, and ultimately falls into the usual, “I'm liking this game but have no idea what's going half of the time!” Final Fantasy pitfall. Come on, we've all been there, don't lie. Like any self respecting Final Fantasy, Type-0 HD puts a large chunk of its focus on combat. However, those expecting the usual Active Time Battle system in which you take and turn and then wait for your opponents response here will be disappointed. Instead, combat in Type-0 HD is free form, fast paced and incredibly fun. Despite the change-up in direction to combat compared to other Final Fantasy games, the usual array of items and spells are here. From Fira to Firaga and Cura to Curaga, this is both the Final Fantasy you know and love as well as new, exciting uncharted territory. The beauty about Type-0 HD's combat is the fact that every single member of Class Zero- and that's a grand total of 14 members- have different and unique abilities and weapons. From students that rely on ranged combat using pistols, quick and nimble attacks using whips to a slow, powerful and lumbering fighter armed simply with a sword, there's a great selection available here. Each team member may look generic due to their lazy character design (thanks again Nomura! ), but there's diversity where it counts. Regardless of what kind of team you assemble from the 14 students available, combat is more akin to, say, Crisis Core: Final Fantasy VII then Final Fantasy I-X. After each military campaign you're given a time limit that counts down until the next campaign. This is technically down time for Class Zero, but in Type-0 HD you need to still get some work done, and this forces the player to manage their free time. You can use this free time to do what you want. From making your way around the school to chat with the vast array of characters going about their business, taking on side missions given to you by other characters, training and building up your characters before the next mission, or heading out into the world to battle some huge creatures, the time limit in place here forces you to use your time wisely. There's also a real-time strategy element to the game that plays out on the world map. It's an interesting diversion from the typical combat system in Type-0 HD, but it never really nails the potential it clearly has. Another welcome diversion is Chocobo breeding, a feature which has become a staple of the Final Fantasy series, and one that Type-0 HD does a great job with. With more breeding options, outcomes and the possibility of using the creatures in battle as an ally, it's a feature that's not to be overlooked. Overall Final Fantasy Type-0 HD is an excellent entry in the series. Granted the story gets very muddled the more the characters drone on, and though there's no excuse for how contrived the plot gets, it doesn't drag down the gameplay. It has slick combat that is both incredibly easy to get into and highly customizable, and a visual HD upgrade that stays true to the original but makes it far more beautiful. Sure the story is balls, but the game itself is bloody great. Final Fantasy Type-0 HD is a fantastic HD upgrade and gets a 4/5.